Five beach plankton tow. 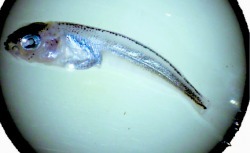 Below is a fish larva found at Severson Cove. Julie L: COASST walk to Pt Hammond, 14:30, cold, sunny, lots of churned-up wrack such as 1/2 foot long kelp stipes, entire eelgrass plants, and shreds of other seaweed. At Hammond: a Great Blue Heron, 2 Bald Eagles, 10 Buffleheads, 30 gulls, 12 Mergansers, 1 Harlequin, a fish head, and Stan W.
Julie: 8:00 the Pileated Woodpecker in our yard is very busy with the rotting apples. Chris W: 17:50. Snowshowers and rain, windy. At dusk, walking down Beezie’s Lane, I could hear two sounds simultaneously: one was a rather high squeaky sound almost like part of a cat’s meow, and the other, a Great Horned Owl sound –(just as described on 12/30/07 by Glen R) – a repeated single note of the Horned Owl’s. Hurrying toward the house, I could see the silhouettes on the ground between the fireplace stonework on the West end of the house and the big Garry Oak tree. A big owl flew up from the ground (clearly a Horned Owl by size though I couldn’t discern the horns) and away to the East over Ludwig’s field and trees, while the other form was still on the ground. As I got closer, it too flew, going West over the trees. Was this an amorous coupling? Seen in L**g’s back driveway these last couple of weeks, a big Helvella mushroom (looks as though Julie’s photo is of the same type, the bottom-most picture from Severson’s Lane). Also these last weeks, lots of Golden-crowned Kinglets feeding on the roadways, and in the woods. Next to Henry’s drive, one Ruby-crowned Kinglet was seen this week. Jannick R says he’s been leaving rats out for the ravens. Unlike in other years, this year a raven has flown over but not stopped for a snack. Mike C says the same thing happens when he sets out chum for the ravens - no bites. Why not? At Janice and Jannick’s pond, a single chorus frog was heard recently but there really is no interesting activity there. The red alder buds are red, but no sign of the leaves. 17:00 at Sandy Point, very low tide, two or three gulls and an ice-cream sunset. Chris W: Red-winged blackbirds heard on Valentine’s Day from beach below Ralph’s swamp early evening, 5: ish. ulie L: Nuthatches singing from the direction of the A’s this morning. People have been saying that they don’t hear as many birds in the morning as in other years. Julie L; 18:00 at Cowlitz, dusk, saw three bats flittering around near the Post Office madrona. Julie L: Another brilliantly clear day. The crocuses are blooming, red-flowering currants, plums, and daffodils not. David L: Light frost last night, after above freezing weather. Lots of robins at the Post Office. Glen R: saw large bumblebee at Winnies, red dead nettle beginning to bloom, also last summers broccolis blooming. 5:15-6:30 p.m Cloudy, wind<1mph, temp=50 fh. Hi tide 7.0 @ midnite approx. Round trip walk Farm Bay landing to Little Hammond. Heard killdeer in fields. No seals or fish seen on walk. In area around Seaweed Rendezvous to Little Hammond about 35 seabirds, mixed: 20 approx 20 buffleheads, 4 goldeneye, 3 gulls, 6 scoters, 2 d.b. comorants. Josie S: 13:40, TNC Cowlitz beach below martin house poles, Calm, overcast following a sunny morning, water clear as viewed from top of TNC bluffs. A few Mew and Glaucous-winged Gulls idled at water’s edge. I took a sample, just ‘cause, and came up with green-looking gammarids, for one thing. Glen R: saw fleeting butterfly (30% chance Mylitta Crescent, 30% chance West Coast Lady, 40% chance other) pass by shoulder at field west of Lower Conservancy swamp. Heard killdeer same place. Julie L: Several Great Horned Owls calling in the Burns’ woods. Light rain in the afternoon, the first in some days. Red-flowering currants, maples, and plums are budding. Crocuses are blooming. David L: Birds are feeding in the shallows of the water. Smallish oil streaks, possibly indicating herring. Two or three weeks ago there was a scummy surface on the water. Kelp is drifting around outside of Cowlitz. Water clarity is about 10 feet.